To download the software, please visit Juniper Netsim Download page. About Juniper Netsim for JNCIA: The software provides a virtual networking environment with virtual routers, switches, and other networking components. Using the software, one should not only be able to run the existing ready made labs, but also design (using GUI configuration tool), configure and simulate a network. The software provides an affordable alternative to learn Juniper IOS commands and configuration without the need for any external hardware or software. There is no need for any JUNOS software to run the program as all the functionality like routing, STP, etc. is built into the software natively, the only limitation being the number of commands available for use. The software is specifically developed to help new comers desirous of learning networking using routers and switches. About Certexams.com: The website provides network simulators and exam sims for various certifications including Cisco CCNA, CCNP, CCDA; Comptia A+, Network+, Juniper JNCIA, and others. We also offer labsims for Comptia A+ and Network+. Please visit the website Certexams.com for more information and available products. Disclaimer: CertExams.com is neither associated nor affiliated with Juniper Systems® or any other company. Junos™ and JNCIA™ is trademarks of Juniper Systems® and duly acknowledged. The Simulator lab exercises material is a copyright of CertExams.com and the same is not approved or endorsed by respective certifying bodies. CertExams.com Revises Its Juniper NetSim thoroughly. Network Simulators Comments Off on CertExams.com Revises Its Juniper NetSim thoroughly. CertExams.com, a leading netsim software developer, released Juniper Network Simulator with Designer after a thorough review. The new version of the software includes several updates to its command support, and the lab exercises. The new features include Host to router/switch communication and/or router/switch to host communication and troubleshooting. Additionally, it supports DHCP configuration on routers and enables DHCP info to be obtained by the hosts connected via Juniper router/switch network. Disclaimer: Juniper JNCIA(R) is a registered trademark of Juniper Systems (R) and is duly acknowledged. Anand Software and Training or CertExams.com are not associated with Juniper Systems or any other company. CertExams.com Updates Juniper JUNOS NetSim to Include NAT, Firewall, and IPv6. Network Simulators Comments Off on CertExams.com Updates Juniper JUNOS NetSim to Include NAT, Firewall, and IPv6. The trial software may be downloaded free from CertExams.com Juniper Junos NetSim product page. 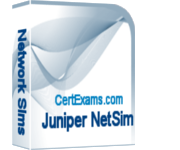 Other products offered in congenction with Juniper NetSim are Juniper JNCIA Exam Simulator and CCNA NetSim. We are currently working on GUI development for Juniper device management in similar lines with our CCNA NetSim GUI.